LENA WAITHE (Showtime’s The Chi creator/producer/writer) + The first black woman to win a Primetime Emmy Award for Outstanding Writing for a Comedy Series (Netflix’s MASTER OF NONE writer/actor | DEAR WHITE PEOPLE, V. II actor) - on her YOUNG, GIFTED, BLACK, & QUEER Carolina hererra MET GALa cape. 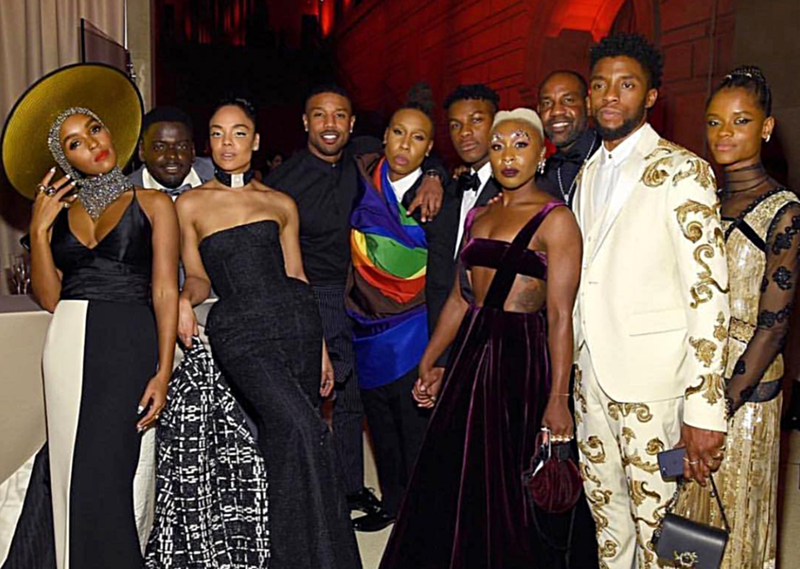 Worth the blur... YOUNG, GIFTED, BLACK, & QUEER (and WAKANDAN)! AUNTIE MAME. HAT, CAPE, PANTS AND ALL. #YGBQ RAINBOW CLOAKS FOR EVERYONE. BLACK AND BROWN INCLUDED. BLACK LACE ARCHIVAL YSL HAUTE COUTURE (C. 1990) RE-ISSUE BY ANTHONY VACCARELLO. 3D PRINTED COCKTAIL DRESS. “MY GOD WEARS A DU RAG.” BRAIDED HAIR HALO. DEGRADÉ TULLE OPERA COAT FOR DAYS! OLIVIA POPE’S GOLDEN SWAN SONG. LIVING FOR THAT BEAUTY CONCEPT! THE BOSS, JR. IN T.T’S SIGNATURE COLOR, SCHIAPARELLI SHOCKING PINK! IN THE ARMS OF AN ANGEL… (WHOOPS, WRONG SARAH!) STILL CHIC, THO. CASSIE (& GUEST) | THOM BROWNE. JK JK - SO FRESH, SO CLEAN, DIDDY. LOUIS VUITTON MEN’S CREATIVE DIRECTOR VIRGIL ABLOH IN ALL OF THE THINGS: JEWELS, EMBROIDERIES, MAN CLUTCHES, NIKES SNEAKERS FOR EVENING…RESPECT. TESSA THOMPSON | THOM BROWNE. OVER THE SHOULDER IS ALWAYS A GOOD IDEA. GROWN-ISH COAT of MANY COLORS. WESTWORLD PLOT-TWIST: THE GILDED AGE. HE IS RISEN. T’CHALLA LIVES. YVES SAINT LAURENT & " The Naughty NUNS "
models mica arganaraz, anja rubik, YSL CREATIVE DIRECTOR anthony vaccarello, amber valletta, kate moss, Charlotte Casiraghi, & Charlotte Gainsbourg.